What is an AKC “field trial”? AKC licensed field trials are events in which dogs compete against each other for points toward Field and/or Amateur Field Championship titles. There are field trials for pointing, retrieving, and flushing breeds. The abbreviation for a “Field Champion” is FC and AFC for an “Amateur Field Champion”. Because these are championship titles, they precede the dog’s registered name. An example is: FC AFC Random’s Best. As you can see from the example, a dog can be awarded both an FC and an AFC title. What is the difference between an FC and an AFC? A dog who earns all of her points from the “open” stakes in a field trial is awarded a “Field Champion” or “FC” title–with the exception of 4 points which are allowed to carry over from winning points in “amateur” stakes. A dog who earns all of his points from the “amateur” stakes is awarded an “Amateur Field Champion” or “AFC” title. A “stake” is a category in which dogs, based on their eligibility, compete in. Eligibility is determined by things like a dog’s age, breed, level of training, and who the dog’s handler is. There are “Puppy”, “Derby”, and “Gun Dog” stakes, with variations of each. All dogs entered in AKC field trials must be registered with the AKC. A “stake” is similar to a “level” in AKC hunting tests. Puppy stakes – Are open to dogs 6 months of age and under 15 months of age on the first advertised day of the trial. Though it is permitted, birds generally are not released in puppy stakes. This decision is to be made by the host club. Dogs in Puppy stakes who locate and point game birds are not to be given additional credit by the judges as this is not considered a requirement for this category. Though it is permitted by the rules, generally blank/starter pistols are NOT fired in Puppy stakes. The event premium will state if blank/starter pistols in Puppy stakes are to be used. There is no hunting test level equivalent to field trial Puppy stakes. Derby stakes– Are open to dogs 6 months of age and under 2 years of age on the first advertised day of the trial. Dogs competing in Derby stakes must locate and point a game bird in order to fulfill the requirements of this category. Blank/starter pistols ARE fired in Derby stakes. Derby stakes are similar to the Junior Hunter level in AKC hunting tests (in that a competing or testing dog must point at least one game bird in order to be considered for a win or qualifying score). Field trial Derby stakes differ from the Junior Hunter level in that hunting test rules require a dog to point at least 50 percent of the game birds she encounters. Another difference is dogs can “age out” of Derby stakes—dogs older than 2 years are not eligible to compete in Derby stakes. 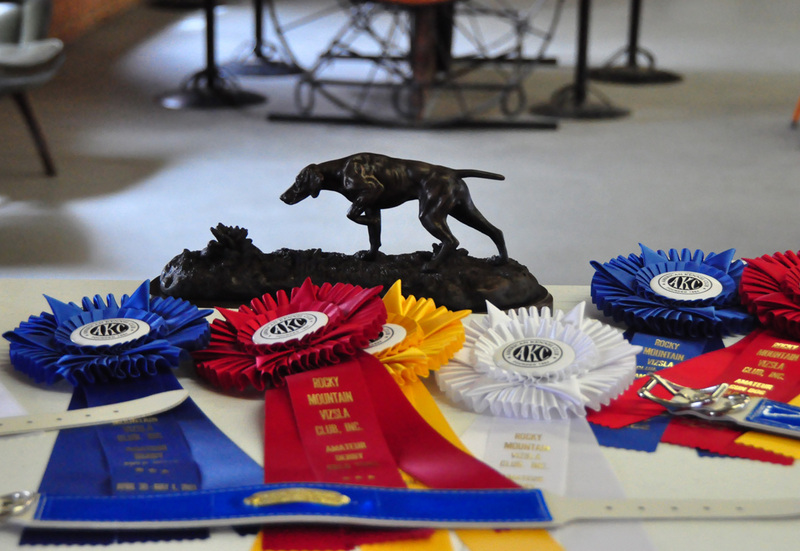 AKC registered dogs of any age can test at the Junior Hunter level. Gun Dog stakes – Are open to dogs 6 months of age and over on the first advertised day of the trial. This category is intended for “finished” gun dogs. A “finished” gun dog is steady to wing and shot (meaning the dog must wait to be released by her handler and CANNOT “break” or self-release at the flush of a bird or at the shot of a starter/blank/shotgun). In order to fulfill the requirements of a Gun Dog stake, a dog must locate and point a game bird and must demonstrate absolute steadiness. Dogs competing in these stakes must also honor their bracemates if the situation presents itself during the course of the brace. Unlike in AKC hunting tests (Senior and Master levels), “call backs” for honoring are not done. Also unlike AKC hunting tests (Senior and Master levels), retrieving is not a requirement for a dog to “win” a Gun Dog stake unless the stake is specified to be a retrieving stake in the premium. 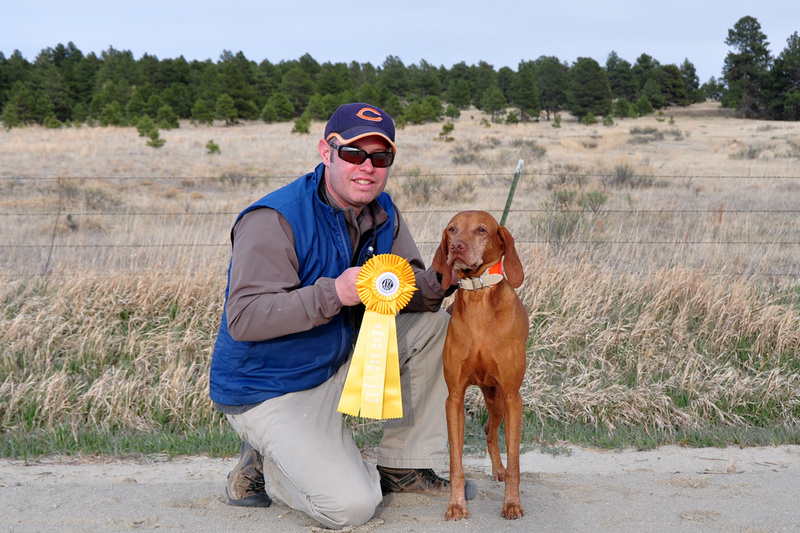 Of the AKC recognized pointing breeds, German Shorthaired Pointers (GSPs), German Wirehaired Pointers (GWPs), Vizslas, and Weimaraners are required to have won at least 4 points in retrieving stakes in order to be awarded an FC or AFC title. The requirements of a retrieve in a Gun Dog stake are the same as those in an AKC Master level hunting test: “After the shot, the handler shall not command or signal the dog to retrieve until the dog’s steadiness to wing and shot has been positively demonstrated. The dog must retrieve promptly, tenderly and absolutely to hand in all retrieving stakes.” Gun Dog stakes are similar to the Master Hunter level in hunting tests in that both are considered for “broke” or finished gun dogs (though there are quite a few differences such as honoring, retrieving, “hacking”/singing, “collaring” a dog away, stop-to-flushes, delayed chasing, nonproductives, style, independence, range). What is the difference between “open” stakes and “amateur” stakes? All handlers and trainers are allowed to compete in “open” stakes (including professional handlers/trainers) while only non-professional (amateur) handlers/trainers are allowed to handle in “amateur” stakes. A person considered to be a “professional” handler/trainer is one who accepts “remuneration (money, goods, or services)” in exchange for the training/handling of dogs. Aaron and Amante (CH Boulder's Bolder Amante SH) celebrate their 1st place win in an Amateur Gun Dog stake worth a 3 point retrieving major. This was Amante's "debut" competing as a gun dog. How many points are needed to obtain an FC or AFC? No more than 2 points each from Puppy stakes and Derby stakes for a total of 4 juvenile points can come from the Puppy/Derby stakes. What is a “Limited” Gun Dog stake? A “Limited” Gun Dog stake is for dogs who have won a 1st-4th placement in any Gun Dog stake, or have won 1st place in an Open Derby stake. Dogs who have only won 1st place in an Amateur Derby stake are only eligible to enter Amateur Limited Gun Dog stakes. Only dogs who have won placements in Amateur Gun Dog stakes or have won 1st place in an Amateur Derby stake are allowed to compete in Amateur Limited Gun Dog stakes. So what is a “Dual Champion” or a DC? An AKC Dual Champion (DC), is a dog who has obtained both a Conformation (bench/show) and a Field Championship title. An example of this is: DC AFC Random’s Best. How do AKC field trials differ from AKC hunting tests? Procedure for Pointing Breeds booklet for the points schedule. In addition to fulfilling specific requirements in Derby and Gun Dog stakes (pointing game birds, proving steadiness, etc. ), dogs are also competing against each other in order to be considered for a placement. AKC hunting tests are NONCOMPETITIVE events in which dogs are judged against a standard in order to qualify for a title. Titles obtained in AKC hunting tests are recorded after a dog’s registered name. There are 3 different levels of AKC hunting tests: Junior, Senior, and Master Hunter. The titles are recorded as: JH, SH, or MH. An example: Random’s Best JH. 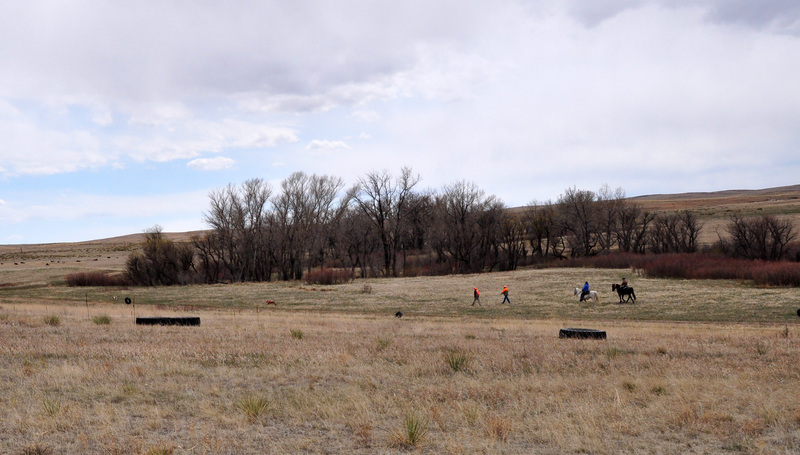 Aaron handles Kosmo in their callback for consideration of a placement in the Amateur Gun Dog stake in the Rocky Mountain Vizsla Club's Inaugural Walking Field Trial. The stake was an all-breed 4 point retrieving major. They did a great job and earned a 3rd placement in the very competitive stake! Judges have the right to “withhold” placements if they feel the dogs they judged did not put up performances worthy of a placement. This includes withholding the placements worth points toward a championship title. Just because a dog “makes it around clean” does not mean s/he will be awarded a placement. Unlike AKC hunting tests, there isn’t a “scoring” system for field trials. If your dog meets the requirements of a stake (puppy, derby, gun dog) s/he is at the mercy of the judges for a win and/or placement. The chances for a placement will be much better if your dog exceeds the requirements and puts on a much better show than the other dogs s/he is running against! Judges have their own preferences as to what they like and so the wins/placements are somewhat subjective. There are “mounted/horseback” trials and “walking” trials. If a trial has been identified as a walking trial in the premium all handlers must handle from foot. Handlers are allowed to handle from foot in horseback trials. “Gun Dog Championships” indicate an event in which competing dogs will be handled from foot only. “Galleries” are kind of a big deal in mounted trials. The gallery rides along, following (but not interfering with) the dogs competing in a brace. Hunting tests have galleries as well but all participants must walk or be carted around in the “gallery wagon” if the host club provides one. Perhaps one of the of the primary differences between AKC hunting tests and AKC field trials is the amount of consideration field trial judges give to a dog’s independence, style, intensity, drive, range, and application. Field trial judges look for many things when deciding which dogs they’ll “put up”—award placements to—but they’re particularly drawn to dogs who move with purpose, are bold, show a lot of style, and exhibit “a keen desire to hunt” and “stay out in front”. Hunting test judges look for these same qualities but because they are judging each dog against a standard and NOT against each other, this gives them the ability to “qualify” many dogs that run under them—as long as the dogs meet the standards for the levels they are testing in. Field trial judges have a limited number of “placements” to hand out whereas hunting test judges can qualify all dogs who meet the standard. Also, though hunting tests are essentially “pass/fail”, the judges must use a scoring system to rate a dog’s performance against the standard. A dog can pass a test with the absolute lowest–or highest–averaged score and is given the exact same “qualify” ribbon as all other dogs who qualified in that same level. There is quite a bit of difference in the “noise” handlers make in field trials versus hunting tests. Field trialers refer to this noise as “singing” whereas it would be considered “hacking” in a hunting test. This level of noise from a handler is penalized in hunting tests and could prevent a judge from awarding an overall passing score. In hunting tests, the acceptable level of noise decreases as the difficult of the test increases–example less tolerated in Senior than Junior and even less in Master than in Senior. 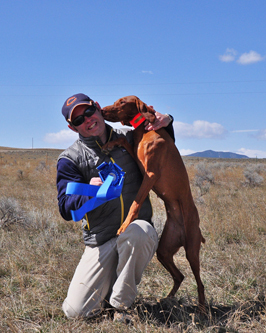 Aaron and Kosmo (CH Derby's Read Em And Weep MH) celebrating their 3rd placement in the Amateur Gun Dog stake in the Rocky Mountain Vizsla Club's Inaugural Walking Field Trial. The stake was a competitive, all-breed stake worth a 4 point retrieving major. Kosmo will be 9 years old in September 2011 has only competed in a handful of trials . There is not an equivalent hunting test level to field trial Puppy stakes. Field trial Derby stakes are similar to the Junior Hunter level in hunting tests in that both categories require the dogs to find and point game and have a blank/starter pistol fired. 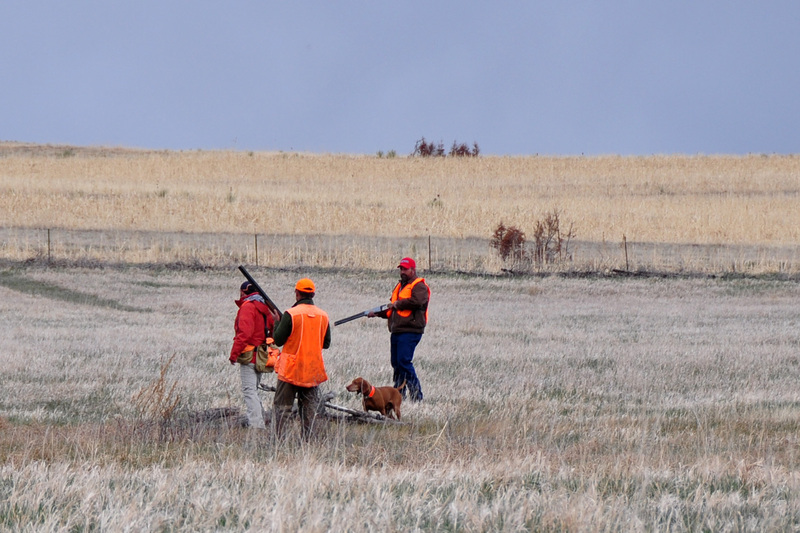 Hunting test rules require a dog to point at least 50 percent of the game birds she encounters. And, dogs can “age out” of Derby stakes—dogs older than 2 years are not eligible to compete in Derby stakes. Field trial Gun Dog stakes are similar to the Master Hunter level in hunting tests. The primary similarity is both of these categories require a “finished” performance by the dogs running. Differences include non-retrieving Gun Dog stakes whereas dogs testing in the Master Hunter level are required to retrieve every bird downed in their brace/call back. Master Hunters are also required to honor in order to qualify whereas Gun Dogs must honor their bracemate if the situation presents itself. Gun Dogs, on the other hand, are shown virtually no tolerance when it comes to “stop to flush” situations, movement at flush/shot, delayed chase, nonproductive/false points. Non-retrieving Gun Dog stakes can be a good place to run a “green broke” dog because all birds encountered on course are “blanked”. Green broke dogs are often in a “transition” phase as they learn absolute steadiness to all shots fired from a shotgun (there is a big difference to the dog between shots from a blank pistol and a shotgun–especially when a bird in flight is hit). Field Championship titles are often viewed as more difficult to obtain than hunting test titles and Bench/Show/Conformation Championships. One of reasons for this opinion is that a dog often competes against dogs of other breeds in order to win points toward her field championship title (though this does not have to be the case–dogs can compete in stakes “closed” to their specific breed and obtain all of their points by winning these “closed” stakes). Conformation Championship titles are obtained by dogs defeating others of their same breed. Hunting test titles are viewed as easier to get than Field Championship titles because the are noncompetitive events. A dog must fulfill the requirements of the level he is testing at in order to be given a qualifying score. Once the dog obtains the required number of passes, he’s earned his hunting test title. Consider this: a dog who wins a placement in a Derby or Gun Dog stake has essentially “qualified” for a hunting test “leg”. Most dogs competing in field trials will take far more placements that aren’t worth points but would have been a “pass” toward a hunting test title! Procedure for Pointing Breeds booklet. 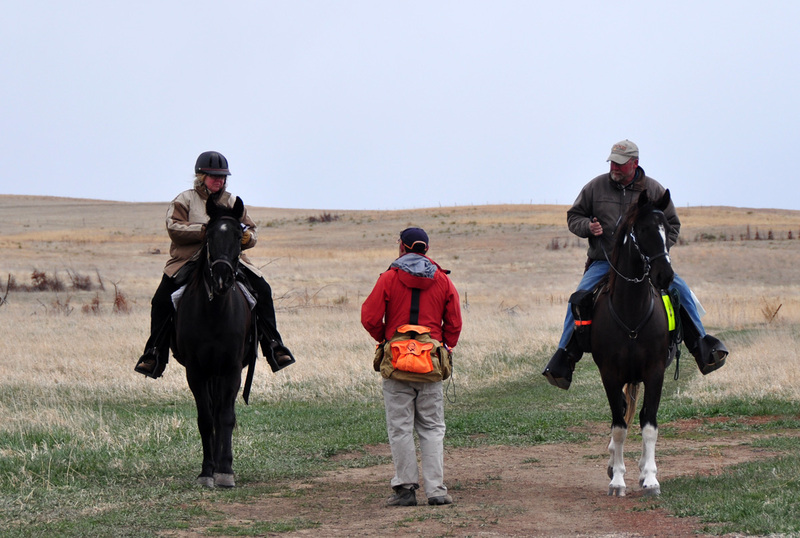 Aaron gets the "callback" plan from judges Joan Heimbach (left) and Eric Cook (right) for the Open Limited Gun Dog stake in the Rocky Mountain Vizsla Club's inaugural Walking Field Trial. Written by Mel Reveles and Aaron Davis of www.FusionVizslas.com. All content is original with the exception of key words/phrases as quoted from the AKC’s Field Trial Rules and Standard Procedure for Pointing Breeds. We are proud to be founding members of the Rocky Mountain Vizsla Club–”The Specialty Vizsla Club of Colorado”, and members of the Vizsla Club of America. We are also members of the American Kennel Club’s Breeder of Merit Program.